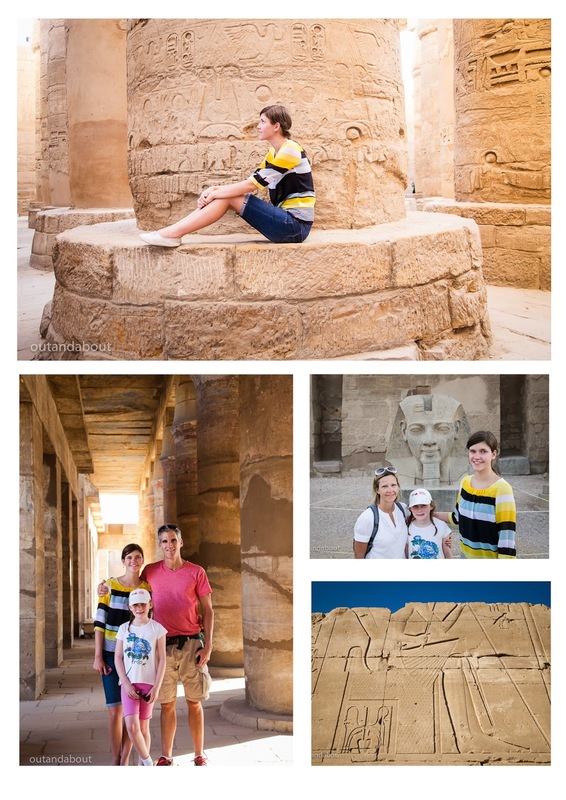 From Cairo we took the over night train to Luxor to begin our Nile Cruise. Let me say a word about the train--if I were to do this trip over again I would not take the train, it was a dirty, smelly mess. I thought I had a high tolerance to all things 3rd world, but the train about through me over the edge. The sheets and pillow case were clean and that was my saving grace because to keep me from going crazy I just had to close my eyes and sleep--or at least try to sleep. It was the most jerky, uncomfortable ride I've had on a train. 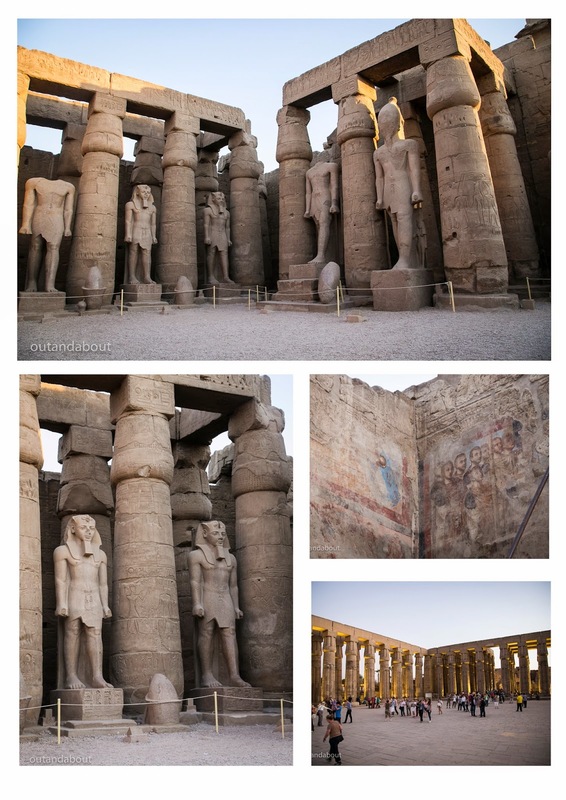 Once in Luxor we were shuttled to our ship, the lovely Sonesta St. George. The cabins were nicely appointed, spacious and after the horrible rest from the previous night, the beds were a welcome relief. 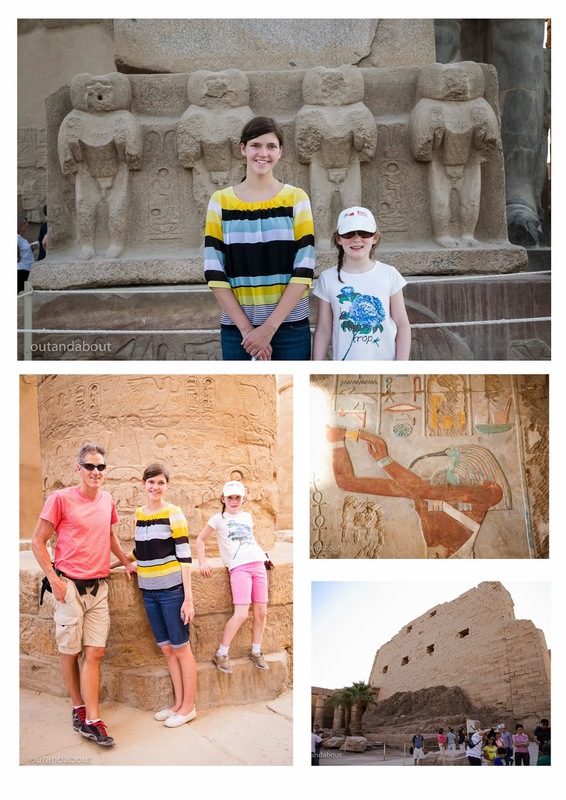 We toured 2 sites that day, Luxor and Karnak. Both are large temple sanctuaries that we did not have near enough time to explore. To see an artists rendition of how the complex would have looked in the full of color of its day click here. I can't tell you how impressive these temples were. 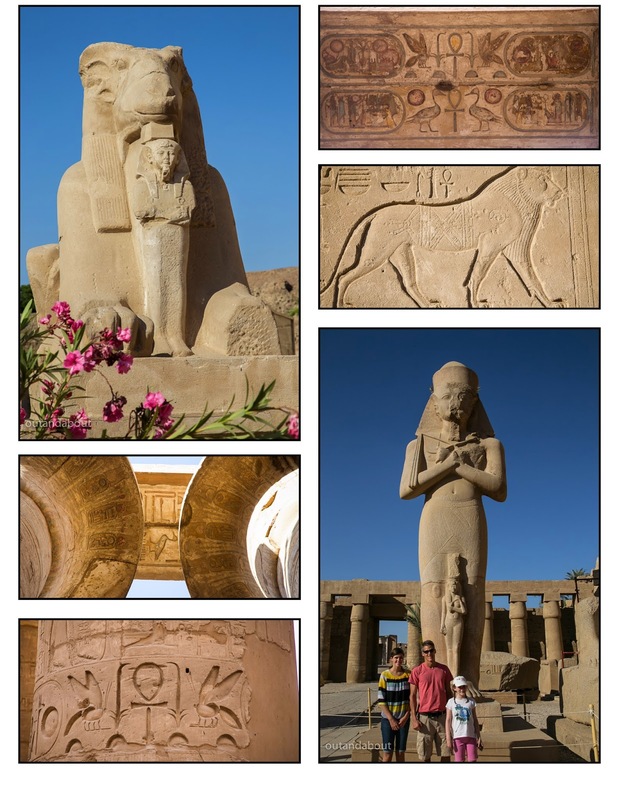 The pillars are massive and completely covered in design or hieroglyphs. Anciently, the columns were erected and covered in plaster. Artisans then carved into the designs into the plaster then applied paint. It's this technique (and the hot weather) that has allowed so much of the design to remain today. Notice Bob and the girls standing in front of the column, this gives you a sense for how big around the columns are. There are 122 of them and they stand 10 meters or 30 feet tall. The Hypostyle Hall, as it is called, is incredible. 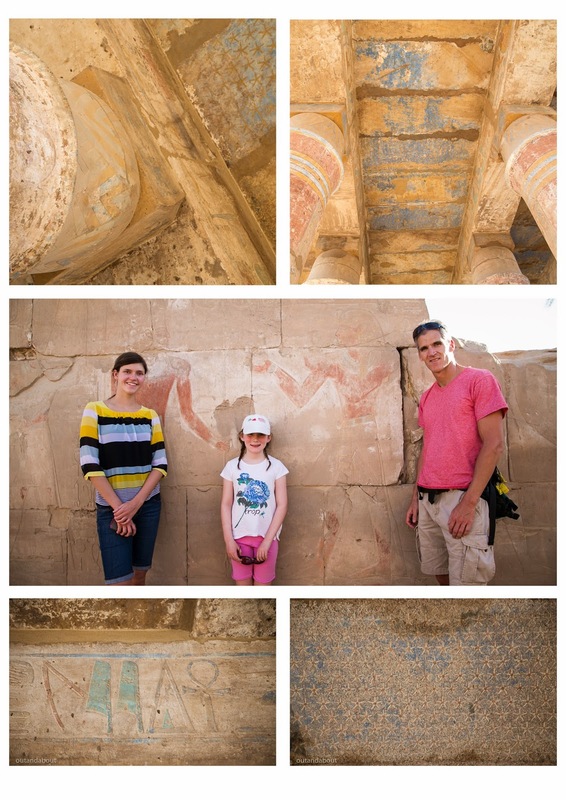 The photo in the bottom right corner is evidence of how the ancients built and decorated their temples. As the temple walls got higher the dirt ramp got higher. When they reached the top they began to paint the structure and worked their way down removing the ramp as necessary. 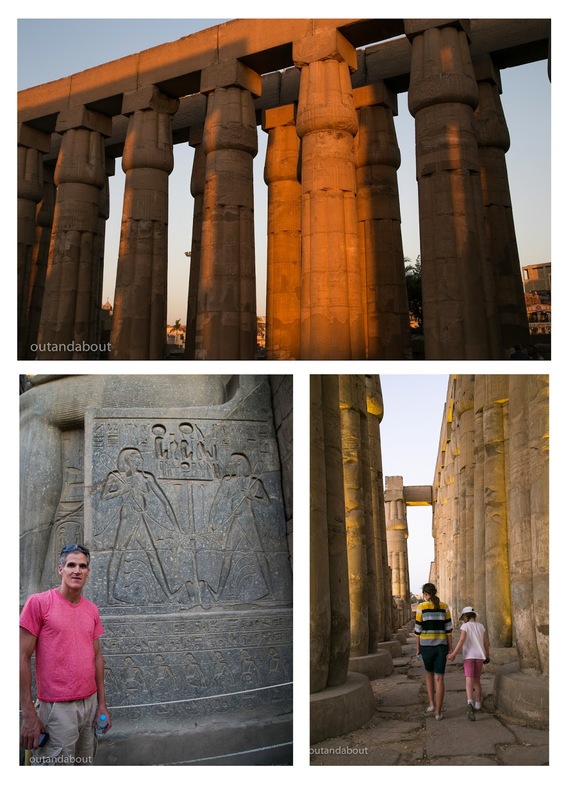 Moving on to Luxor--again amazing. You just have to look at the photos and commit to one day visit this place. When the Egyptians were overthrown eventually the Christians moved in and used the pagan temples as their own, making a few minor changes along the way like painting over the ancient hieroglyphics with their own apostles and pecking out the faces of the Egyptian Gods. This destruction is seen universally over Upper Egypt. 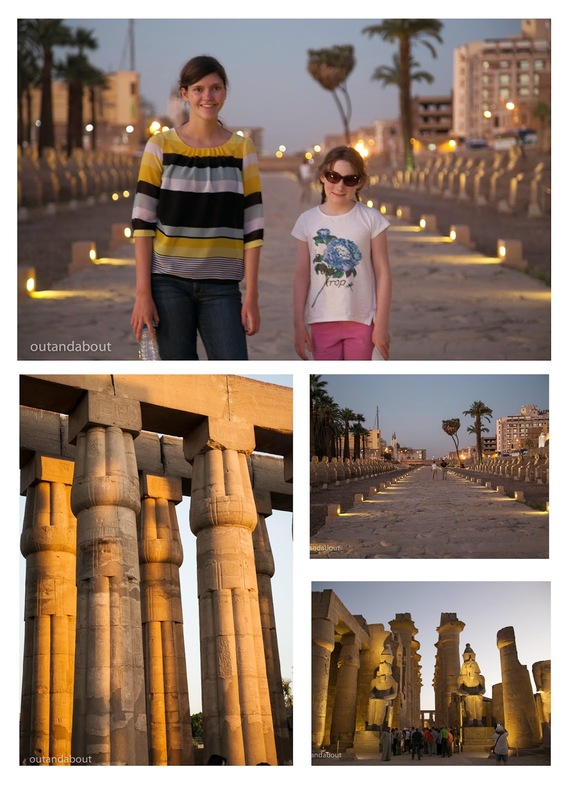 Anciently, Luxor and Karnak were linked by a 3km processional way lined with Sphinxes (yes, that is the plural). Archaeologists are working to reconnect the two, it is an awesome site. You've caught some amazing photos there. Great captures! Thanks for the heads up on the train! I hope you are going to post some pictures of your ship! A cruiseship or riverboat? 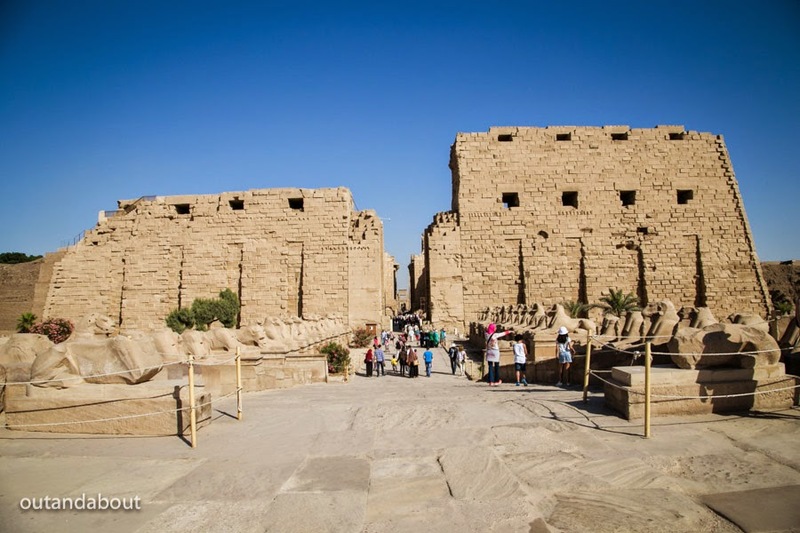 Anyway, you have me totally jealous now as I have wanted to go to Eygpt for years. It will happen, but it may be a few years when the girls are a little bit older. I find it so impressive that they were able to build all of this without modern technology. What an amazing adventure! So much history. Good to know about the train. But the rest of your trip sounded quite lovely. And your pictures are gorgeous. Thank you for sharing at Inspire Me Wednesday. Featuring you in this week's issue.